In a restroom at EPF headquarters, Dr. Shevlin is attacked by an invisible Mondo Gecko who steals his security pass. Mondo proceeds to sneak into the EPF server room and download as much data as he can get away with. 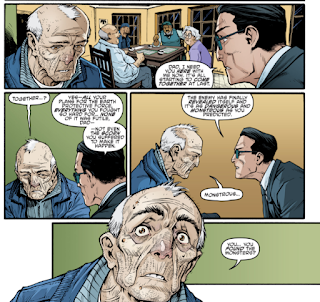 At the Greater New York Senior Living Center, Agent Bishop catches up with his father who seems to be suffering from senility. Agent Bishop tells his dad that everything he worked for in setting up the EPF back in the day will soon bear fruit, as the EPF is about to track down and stop the monsters challenging the Earth. Bishop's dad slips into lucidity and tells his son a story about President Eisenhower and his trip to Area 51. Eisenhower was so horrified by the things he saw there, he left office with a very different view of the military and government. Bishop's father warns his son that some questions are best left unanswered before slipping back into senility. As a nurse wheels his father away, Bishop gets a message from Colonel Knight that Agent Winter and Dark Water are in contact with the mutants and need back up. Bishop climbs into his van and wires himself into the VR device used to control Slash. At Mutanimal HQ, Winter has the building surrounded. Hob pulls out a stash of Null brand stun guns and grenades and suggests he create a diversion while the Turtles make a run for it. Leonardo agrees with the plan, provided they all run in different directions and meet up later. Hob lays down cover fire while the Turtles run off in pairs, but Raphael is quickly tranqed, leaving Donatello to carry him. Leonardo and Michelangelo are soon subdued by a microwave transmitter mounted on an assault van. Hob provides more cover fire and destroys the transmitter, but their escape is thwarted by the arrival of the mind-controlled Slash. Before Slash/Bishop can pound them, Sally Pride arrives in the stolen EPF assault van and picks everybody up. A chase follows, but Sally manages to ditch the EPF by driving off a bridge and sinking the van. The Turtles, Hob and Sally then discretely swim back to the sewer access of the church lair. In the lair, they're met by Mondo Gecko who shows them a news broadcast. Detective Lewis is covering for the EPF, citing to the public that the chase and bridge crash was just a "training exercise". Mondo then hands Donnie the data files he got from the EPF, but they turn out to be nothing put human resource documents with names, addresses, next of kin and so on. The Turtles and Sally begin arguing over what their next move should be; Raph and Sally wanting to storm the EPF while Donnie and Leo think they should hold off since they're clearly outgunned. Mikey then notices that Hob is missing along with the EPF's HR files. 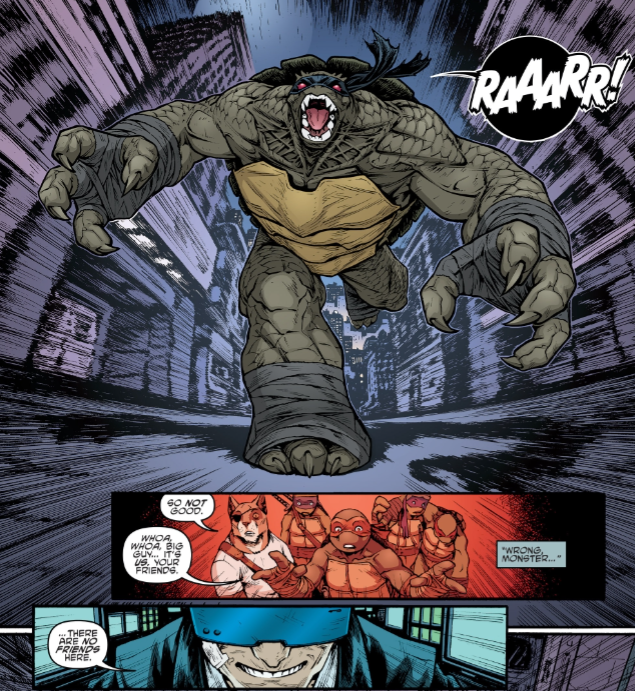 *This story is continued from TMNT (IDW) #68. 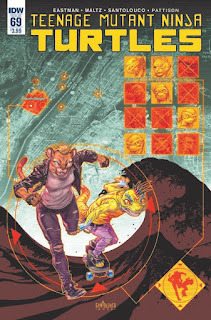 The story continues in TMNT (IDW) #70. *If you're curious how everyone swims from the bridge to the lair so fast, it's actually consistent with TMNT (IDW) #48. Hooray for spatial awareness! *This issue was originally published with 7 variant covers: Regular Cover by Santolouco, Subscription Cover by Kevin Eastman and Tomi Varga, Retailer Incentive Cover by Nick Roche and Tomi Varga, El Paso Comic Con Exclusive Cover by Eastman, Fried Pie Con Exclusive Cover by Zach Howard and Nelson Daniel, Excelsior Collectibles Exclusive Cover by Alex Kotkin, and Planet Comic Con Exclusive Cover by Eastman. 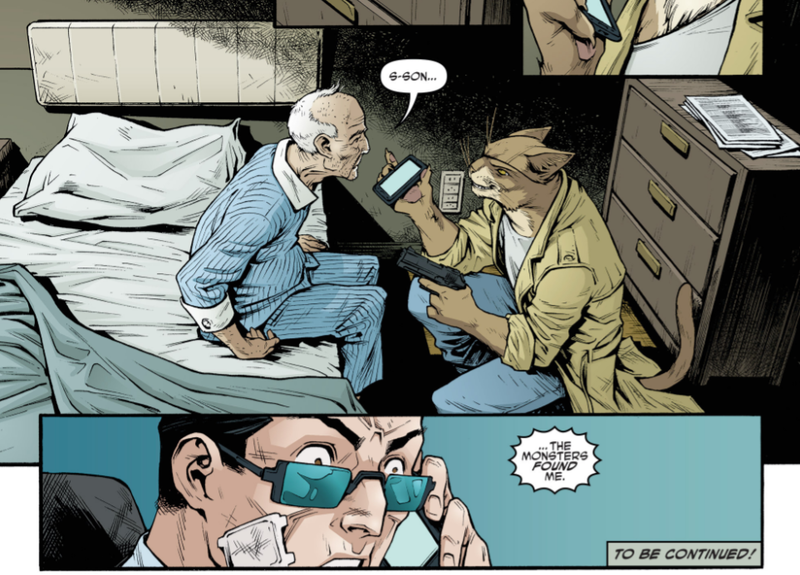 Still, even if we don't have the deepest emotional connection to Bishop's dad, I think we can at least appreciate the situation as presented and the lengths Hob is going to in order to get even with his foe. Taking a senile geriatric hostage is low, but Hob is an "ends justify the means" kind of guy. And even if he's threatening to splatter the brains of a geezer, he's doing it to try and get his friends released from the EPF. It's another good example of that balance Hob's had going for him; he does the wrong things for the right reasons. In terms of script, the scene where Bishop talks to his dad is a bit eye-opening for the character. 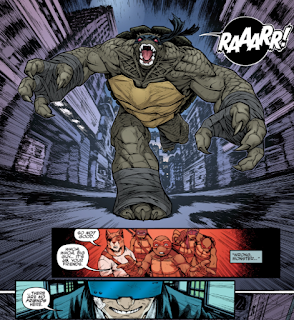 All other media portrayals of Bishop present him as a cold and distant individual (the 4Kids incarnation is an immortal super-human who was abducted and experimented on by aliens, the Nickelodeon version is an Utrom in a robot body), so to see him sharing a tender moment with a beloved family member is new ground for the character. It also conveniently opens up a weakness for Hob to exploit in the same issue its introduced, but that's writing economy for you. The script does this weird thing, too, where we're given the first and last name of the nurse who wheels Old Man Bishop away ("Angie Starks"). It's emphasized and drawn out, like knowing her full name is important. 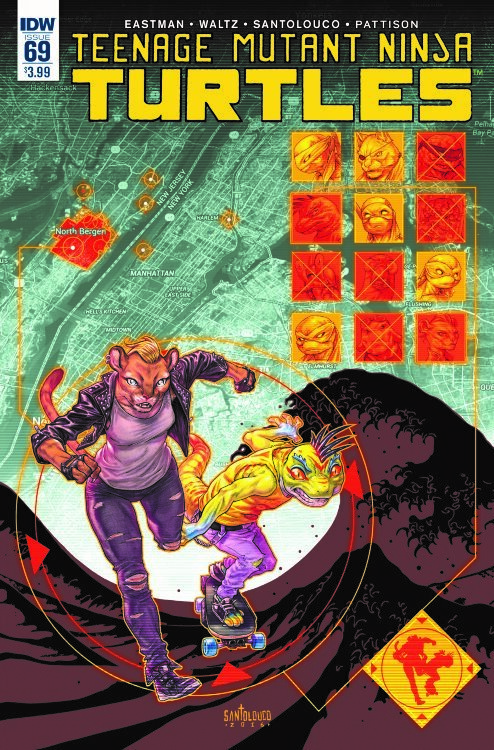 If she doesn't wind up doing something substantial in later issues then I'll really be at a loss as to why Waltz and co. were so desperate for readers to know her full name. 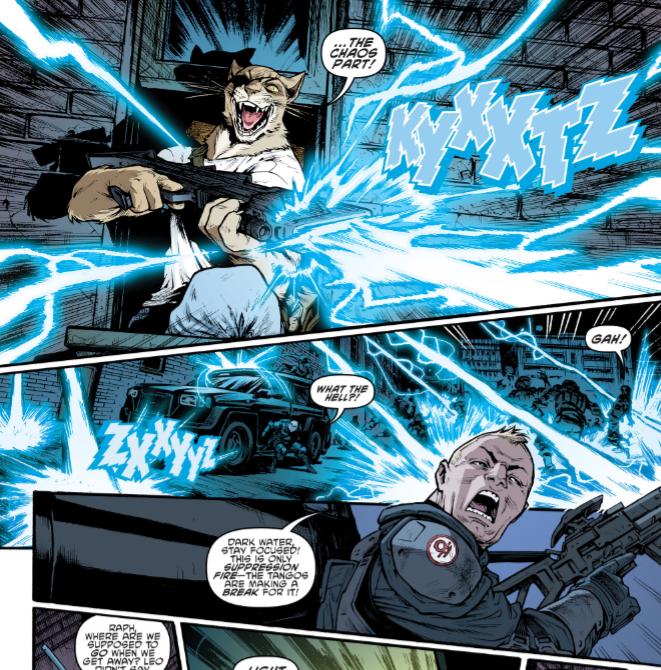 Aside from that opening bit with Bishop's pop, this installment is mostly action and boy is it something. I love conflicts where the Turtles are up against serious odds and wind up taking it on the chin, and this issue doesn't disappoint. The Turtles and Hob get absolutely wrecked and their slapdash plan crumbles as soon as it starts ("Split up and I'll cover you! Oh god never mind just run!"). There's also a nice change from suspense to humor once Sally shows up and the car chase is allowed to get a little goofy. Keeps you on your toes. 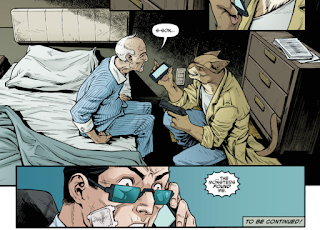 The mood whiplash in general is something I don't mind, as whenever the book starts to get TOO intense, they dial it back and remind us that this is "Teenage Mutant Ninja Turtles" we're dealing with so don't take it TOO seriously, but then we get an old man held up at gunpoint and things get dark again. While the stuff with Old Man Bishop could have been paced out a bit better, I'm still enjoying the heck out of this arc. Lots of Mutanimals, lots of Bishop and lots of Santolouco. Couldn't ask for more.